As a child I remember hearing tales of the Maltese Falcon. It turns out there is no truth to this story, adapted from a fiction book and eventually used in a popular film with Humphrey Bogart. I mention this because it's the closest I ever thought I'd get to Malta which seemed unfathomably distant. Yet by some miracle, here I was, standing on the 4th deck of the Corinthian sailing into the Grand Harbor of Valletta, the capitol of Malta. I felt a swell of excitement, joy, and pride while approaching the land. The city is built on a rocky cliff and consists of both ancient and modern buildings. Malta is actually composed of seven different islands, only three of which are inhabited. Just 400,000 people call it home, though the country receives nearly 2 million visitors each year. Ninety percent of the island is Roman Catholic, and they have one of the most beautiful churches in the world, the Co-Cathedral of St. John. 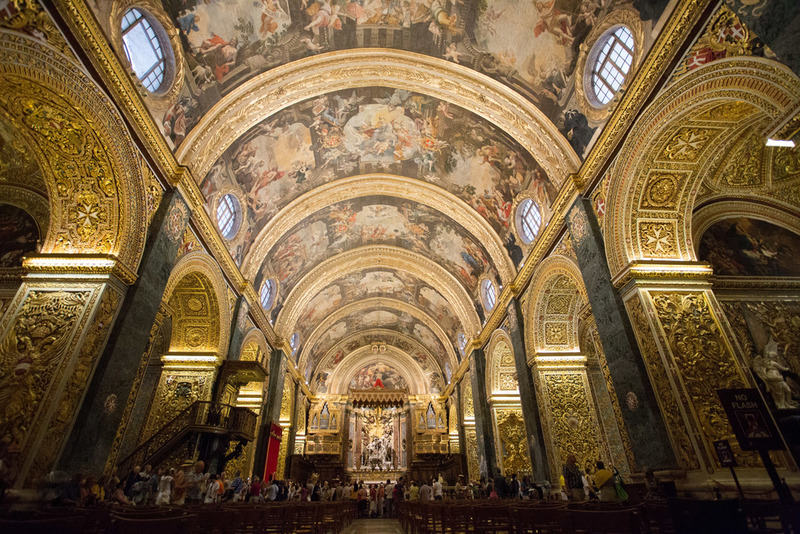 Having previously visited St. Peter's Basilica in Rome and the magnificent Duomos of Siena and Florence, I can honestly say that St. John's was equally awe inspiring with layer upon layer of gold gilding and detailed carvings in precious marble floors. The sheer size was humbling, and I craned my neck to take in its full scale with a wide angle lens. In this church, we came to see the original, and largest painting Caravaggio ever created. It's called the "The Beheading of St John the Baptist". Made with oil on canvas, it is thought to have been painted in site with the old lighting arrangement in mind. In sheer size and drama, I could see why it's often referred to as "the painting of the 17th century". The painting is gory with a pool of blood collecting on the floor beneath St John. Behind him, a man points callously to a bucket as if to signal where the head should go. I was moved by the piece, the contrast, and the fine artistry involved in painting his subjects. The way Caravaggio used light and shadow is splendid and I just allowed myself to be still for a few minutes, feeling the power of this masterpiece. I bought a couple of postcards of the painting as photographs in this room were strictly forbidden. After this moving sight, I used the free time to talk with a shop owner at a small souvenir booth near the main square. This method of getting to know people has proven effective in previous ports, and I just couldn't resist asking if she had heard of Corradino Heights, which is a place I found on the map in Malta. The conversation that ensued is something I will keep in my heart forever. She said "yes, it's near Paolo, not far from here". I showed her my name tag, and said, my surname is Corradino, and I wonder if I have family here. "Corrrrr-a-deeeno" she responded, it is not a common name, but is of Maltese origin. She said I should visit, and handed me a coin saying, "It's for good luck in tracing back your heritage". Obviously touched, I thanked her profusely and looked down to see the word "Malta" on an old five cent piece with a picture of Maltese ruins. Suddenly I felt as if I had a new highlight of the trip, a real authentic experience with a native of Malta. Like Sicily, I felt a connection to this special place, and will always remember my visit here. I tucked the gold coin safely into my memory card holder for safe keeping before moving on. I picked up some unique, and beautiful gifts that were handmade in Malta before rejoining the tour guide. He mentioned that Malta's official national languages are English and Maltese. Maltese is a mixture of several languages, the most predominant of which is Arabic, in addition to Italian, French, Spanish, and English. Our next stop included the fine Magisterial Palace where I photographed myself next to a Knight in full armor. This was followed by a prehistoric archaeological site called the Tarxien Temples. I was conflicted about this particular location as it was originally constructed between 3600 and 2500 B.C., yet many of the original pieces were moved to a museum, and replaced by reconstructions. The sun was beating down with very little space in the shade. Thankfully we just stayed here for about 20 minutes before returning to the bus where I guzzled the rest of my water. Once we reached our ship the guide said "Saħħa" which means cheers/bye/health in Maltese. I has to set my clock ahead one hour as we sailed through the deep Ionian Sea with depths of 10,200 feet! On Sunday evening we will arrive at Argostoli, Greece on the island of Cephalonia (pronounced Kef-a-lonia).